After plugging in the QuNeo, it will automatically load the last preset you used. The first time, it will load Preset 1. To enter preset mode, quickly tap the Mode button so that it begins to flash blue. After entering Preset Selection mode, the pad for the current preset will be illuminated in red. 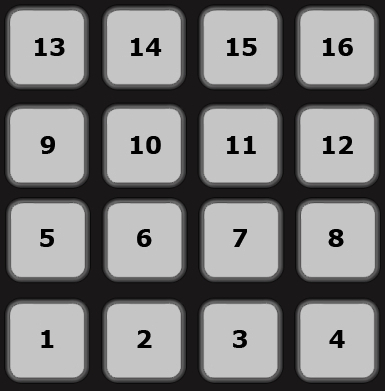 Select a preset by pressing one of the pads. The selected pad will briefly blink green and QuNeo will exit Preset Selection mode and go to the selected preset. Tapping the Mode button again will put QuNeo back into Preset Selection mode at any time. For detailed information about the factory presets, see the Factory Preset Guides document.